The V8 Supercars apprentice upstaged the master in Auckland on Saturday. While four-time series champion Jamie Whincup broke through for his first win of the season in the second 100km race of the day – and his first at the circuit – a teenaged New Zealander and fellow Holden driver was the talk of the Pukekohe track. Scott McLaughlin made history when he became the youngest winner with a popular victory in front of home fans in the opening race. The 19-year-old steered his Commodore VF into the lead on the 12th lap of 35 and held on for a breakthrough win in just his ninth race start. 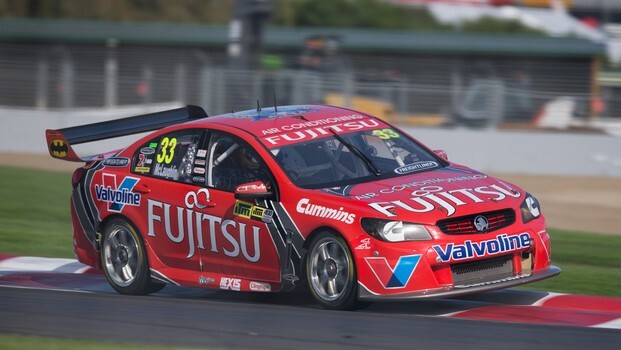 Jason Bright was second and Craig Lowndes third to complete a podium cleansweep for Holden. "It was the coolest feeling of my life," McLaughlin said after the race. "I felt the whole pressure of New Zealand on me as well. It was so hard and it was awesome. "This is so big for myself, my family and my team. They all deserve it so much. "For me to be in the history books in this category ... is unbelievable." The Christchurch-born McLaughlin is in his first season as a full-time V8 Supercars driver after winning the development series title last year. Contrast that to Holden's pin-up boy Whincup. In his 12th V8 season and with more than 270 race starts to his name, the 30-year-old has achieved just about everything in the category. And he had to dig deep after race one went pear-shaped. Starting on pole, Whincup went straight ahead at the very first chicane and was forced to pit to replace a shredded front left tyre. He was then black-flagged by officials for exceeding the pitlane speed limit and finished 26th out of a field of 27. But after pole-sitter Fabian Coulthard jumped the start of race two, Whincup scored his first win in his new Red Bull Racing colours after surviving a nudge from Ford rival Mark Winterbottom on the final lap. "Clearly Mark was very quick, but he had a big lunge – a silly lunge on the last lap," Whincup said. "Hopefully the stewards don't penalise him and they leave it up to us to sort out on the track. "We all race hard and we should be able to go through a corner two-wide – no problems at all. "But he was all locked up and out of control and took me out." Winterbottom's Ford Performance Racing teammate Will Davison was 1.35sec behind in second while Holden Racing Team's Garth Tander was third. It continued a dismal record at Pukekohe for Ford, the manufacturer with just one race win in 24 attempts at the circuit on the southern outskirts of the city. "I'm pretty satisfied with today – obviously not doing handstands but it's great to be back on the podium," Davison said. "I'm rapt to get these points and, when I feel like I've got that pace a little bit more, that's when I'm going to be going all out to win." McLaughlin finished 24th in the second race after getting in trouble late but he was still beaming when recounting his earlier triumph. "I just took it on the chin... nothing's going to spoil my day," said McLaughlin, who moved up to fourth in the championship behind Whincup, Davison and Lowndes. There will be another two races of 100km each on Sunday.